The Inside Passage of Alaska is kayak country. Travel along with author and adventurer, Michael Modzelewski, as he guides you on a thrilling journey through the scenic waterway, fishing for King Salmon, camping on wilderness islands, and surviving a Grizzly Bear attack. Paddle on into Tracy Arm Fjord, one of the most spectacular wild places on the planet, as you encounter inquisitive Sea Otters, angelic Arctic Terns, gamboling Mountain Goats on the high cliffs, and Bull Moose with a big problem up a side valley — while a Glacier, the icy sculptor of this land thunders and booms, calving sapphire blue icebergs into the water around you. In quest of transient Orcas, like the author, you just might find the way to your true home. 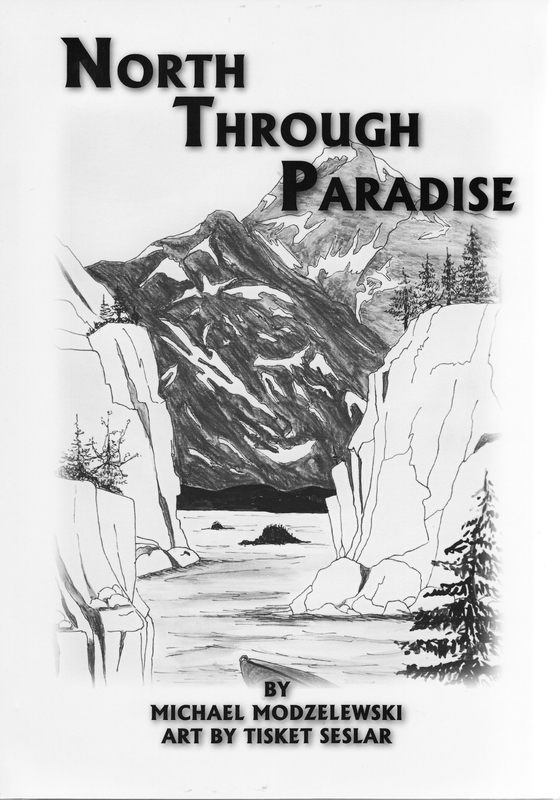 Written with gentle wisdom and great compassion for the northern land and sea, and illustrated with superb drawings by award-winning Alaskan artist, Tisket Seslar, North Through Paradise, is a book to slowly savor and treasure forever. “Tap tap tap. . . Tap tap tap. . . He opened his eyes and pulled himself upright, after sleeping in the kayak, into a bright morning, looking for the person making that repetitious sound. With his abrupt appearance, the kelp patch erupted with motion and the air was pierced with shrieks. Half of the furry brown creatures rolled underwater and the other half lifted their heads straight up — round brown eyes swelling and long whiskers twitching as they examined the beast who popped out of the log. The subject of such rapt attention, the kayaker smiled, realizing that he had slept in the midst of a sea otter colony. Some of the otters were so relaxed in his presence that they cleaned and preened, splitting hairs with nimble hands and then they blew bubbles through the fur that trapped the air and the otters’ body heat within. He marveled how the mammal kept warm in the cold ocean with a bubble blanket. On the outer edges of the kelp forest, mothers with tiny pups, fur balls maximum cute, clung to Mama’s chest as she did the backstroke. He watched as a few of the mothers secured their newborns to the kelp raft by wrapping them in a rubbery frond — then rocketed down to the sea floor to bring-up breakfast. Artist Tisket Seslar is a long time resident of Juneau, Alaska. She moved to Juneau with her husband and five children in 1976. Primarily a self-taught artist, her current mediums include scratch board, pen & ink, dry pastel, and oil pastel. She has acquired formal training at the Universities of Washington and Alaska. She is also certified through the North Light Art School. Her range of subjects varied over the years, however, her main interest is painting wildlife and landscapes. Her unique style of scratch board blended with bright pastel has been a favorite of her clients. For a period of ten years, she worked as a cartographic technician for the USDA Forest Service. her carto tech and graphic projects were numerous for other federal agencies. Tisket has been exhibiting for over 40 years. Some of her credits are designing the 25th Anniversary Cache Cover for the Philatelic Society to designing the Golden North Salmon Derby’s belt buckles and pins. One of her art designs was incorporated into the glass entrance door for the USDA Forest Service EAM Division. She also has had numerous group exhibits and her commercial, fine art, and prints are seen worldwide. With his pen and paddle, Michael Modzelewski moves us — through the northern ocean and into new geography in our minds. North Through Paradise is Michael’s best book. He is a poet in prose! Michael Modzelewski writes the way he lives his life — with great passion, courage, and a love for all things wild and free. Read and reap. Tisket Seslar is one of my favorite Juneau, Alaska artists. Her ability to capture a scene is wonderful and all her ‘critters’ obviously have great personality. Tisket’s artwork invites the reader to join this kayaking adventure. One moves with the animals, the paddler, the waves and clouds, inspired by a sense of connection with all that is Southeast Alaska. Her ability to show intensity and emotions in her animals is born from her deep connection with them over a lifetime of observation. Their eyes reflect the spirit within and speak the truth of nature. Her work is both uplifting and healing for those who know this world, and those who dream it.